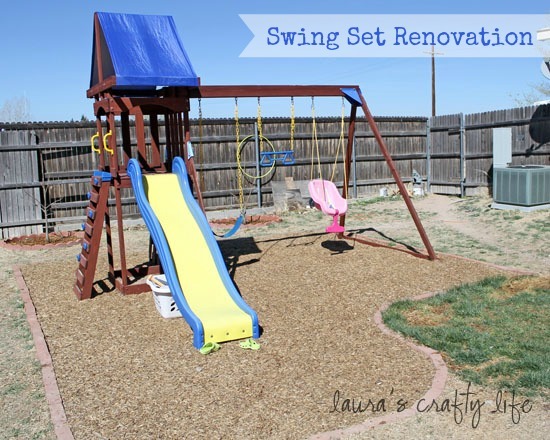 Swing Set Renovation. 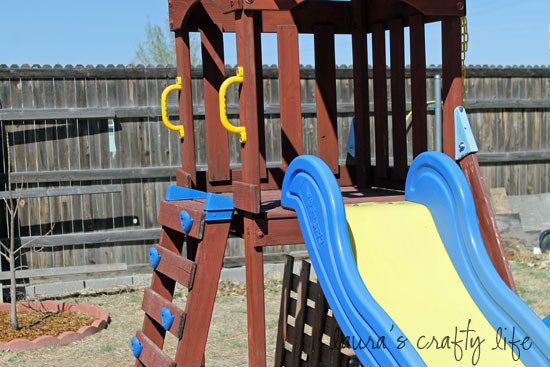 Learn how I renovated and revived our old, worn out swing set with paint, stain, elbow grease, and some TLC. 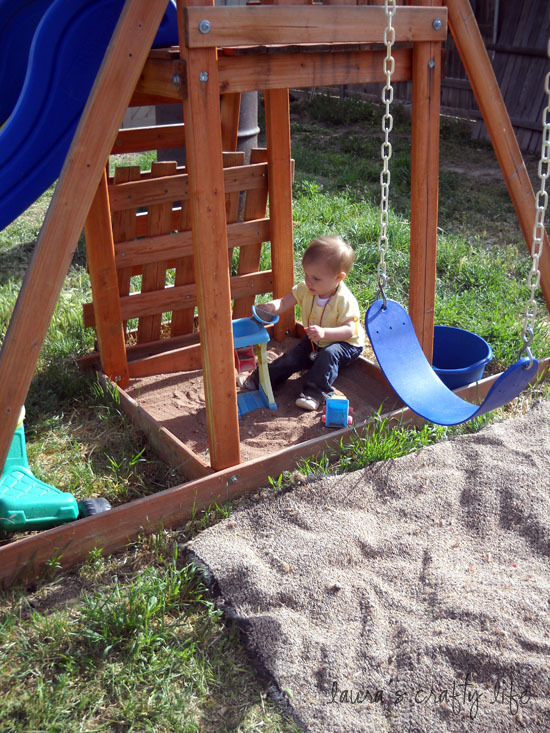 I have been working on our swing set renovation for about a year (nothing like a speedy project, huh?) and I am so happy to finally get to share pictures of the finished product. We got our son a swing set from Walmart when he was 3 years old. 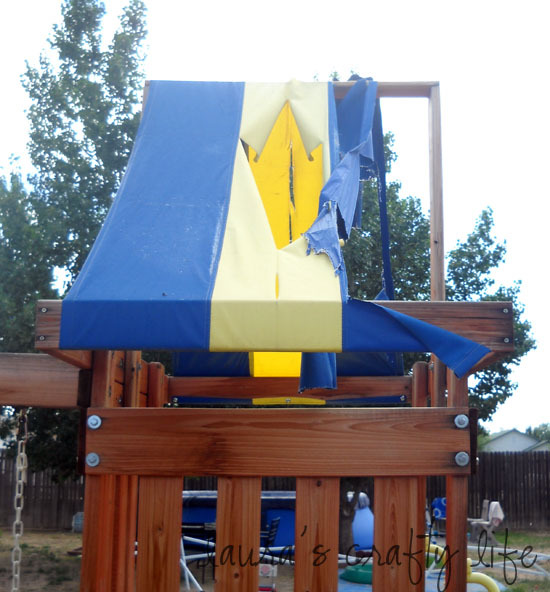 After a year or two, the swing set really began to show a lot of wear and tear. We live in an area of Arizona that has hot summers, and very windy weather throughout the year. The canopy got completely shredded by the wind. The wood and plastic pieces became extremely faded by the sun. 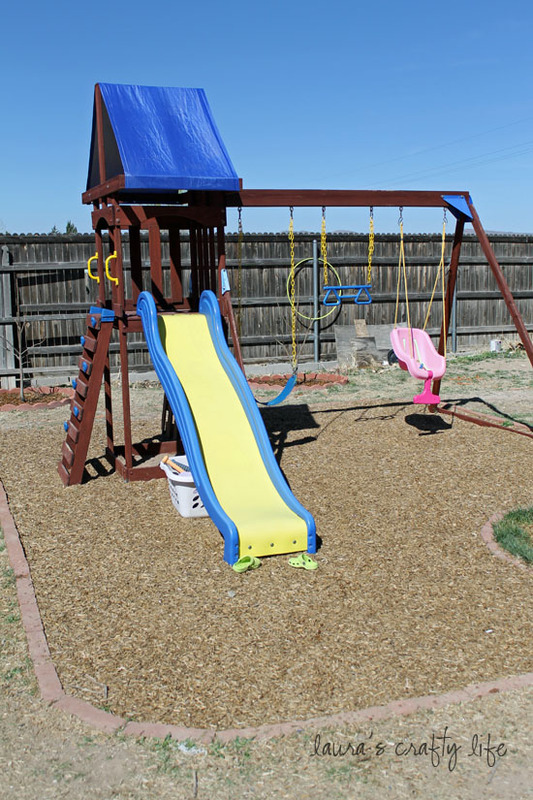 Plus, we have been slowly working on landscaping the backyard, and I knew I wanted a special design around the play area. We are doing all the work ourselves, so it has been a slow process. I had a rough idea in my mind of what I wanted the bricks to look like. Each time I would go into town (we live about a half hour from Home Depot), I would purchase 10 to 15 bricks. This made the cost seem more reasonable, and I hauled and set the bricks a little at a time. 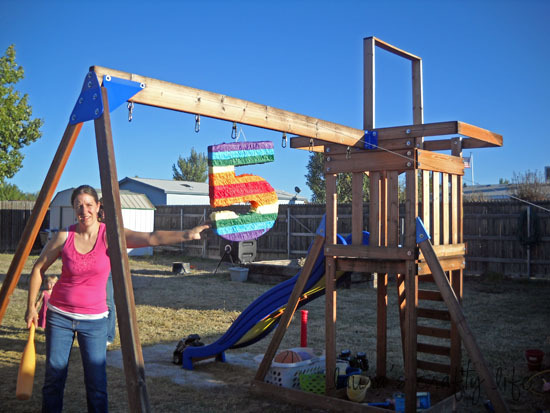 After what seemed like thousands of bricks, I eventually made it around the entire swing set. Two of the corners are square and the other two are rounded off. Once the bricks were (finally) laid down, we added weed barrier under the whole area. We purchased a truckload of mulch and put that over the top. One other thing you will notice in the pictures is the grass! I am a midwest girl at heart and I have wanted grass in our backyard forever. My husband was not convinced that sod would do well in our backyard. At the end of last summer, a friend of ours was laying sod in his backyard. He had a bunch of scraps leftover, and I jumped at the chance when he told us we could have them. I quickly prepared the ground in front of the bricks and we laid a little square of grass. It did well last year and is coming back nicely this year as well! We have some patchy spots but that is mostly from the dog using it as a toilet! 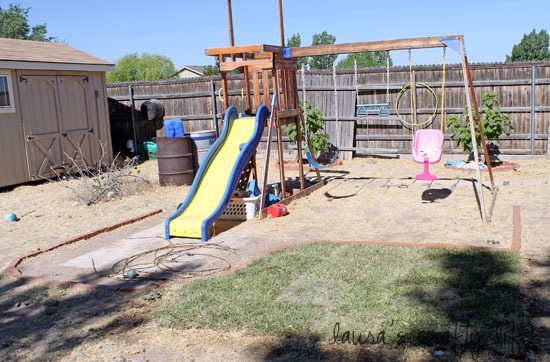 I am hoping to add more grass this summer or next summer so we have a larger area for the kids to run around. 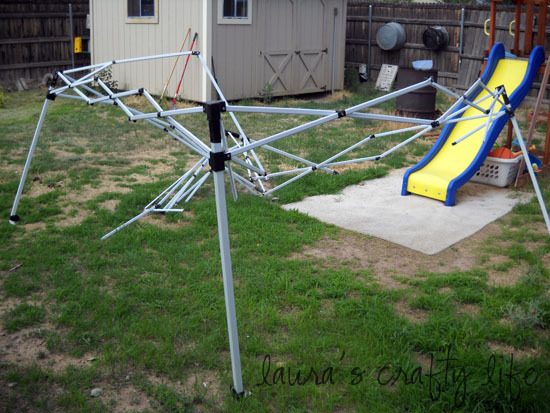 I took all of the plastic pieces off the swing set. 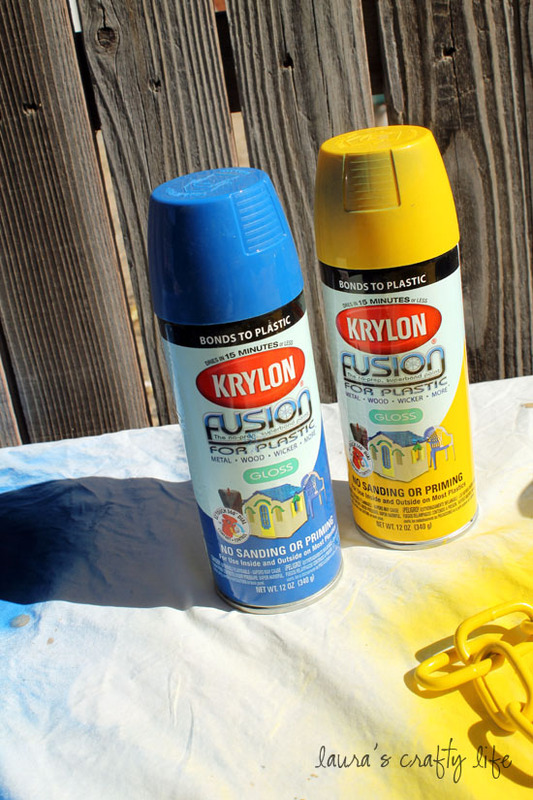 I purchased Krylon for Plastic yellow and blue. This stuff works great. I gave each of the pieces a good scrub, allowed them to dry and applied 3 light coats of paint. 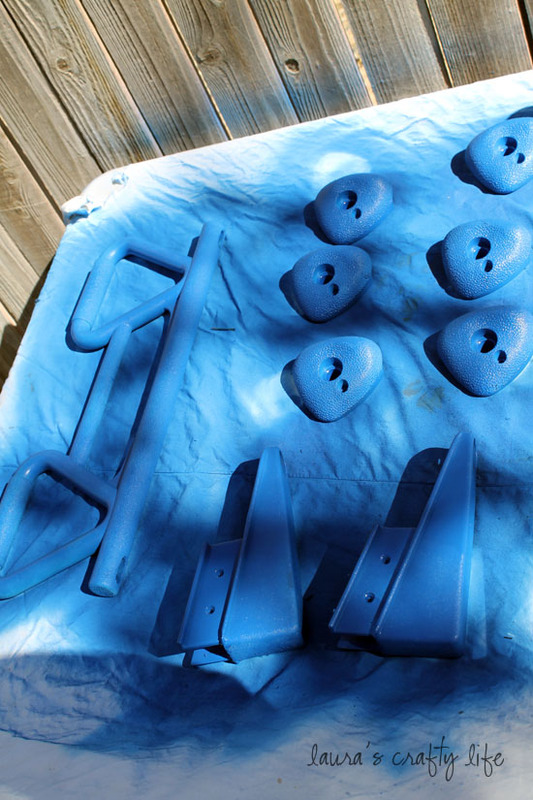 I ended up painting the little ‘rock wall’ grips for the ladder, the handles, the swing chains, the little monkey bar, and some support pieces. Helpful tip: Be sure to allow the paint to cure for the recommended amount of time – this will be listed on the spray paint can. Mine required seven days for the paint to cure. Since all of these pieces were going to be seeing a lot of use from my kids I made sure to wait the full seven days. 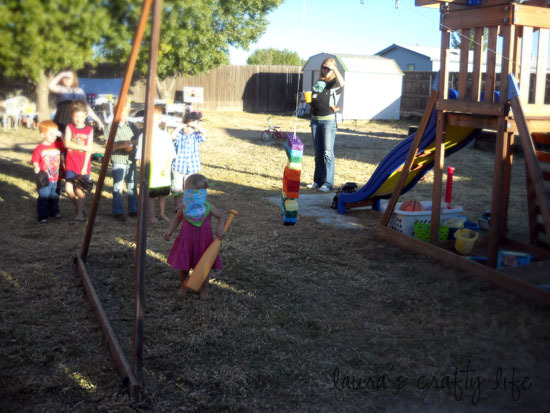 The kids were so restless about not being able to use their swing set for a whole week! But, I can happily say, I painted these last November and they still look as good as new! 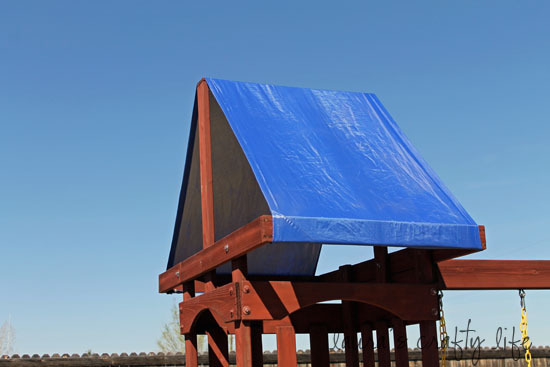 While the paint dried on the plastic pieces, I stained the swing set to match our deck. It was a little darker than the original stained wood, but I like how it now coordinates much better in the backyard. It took a lot more time and stain that I originally anticipated. I think I used about a gallon and a quart. Since it was so faded, the wood just sucked up the stain! 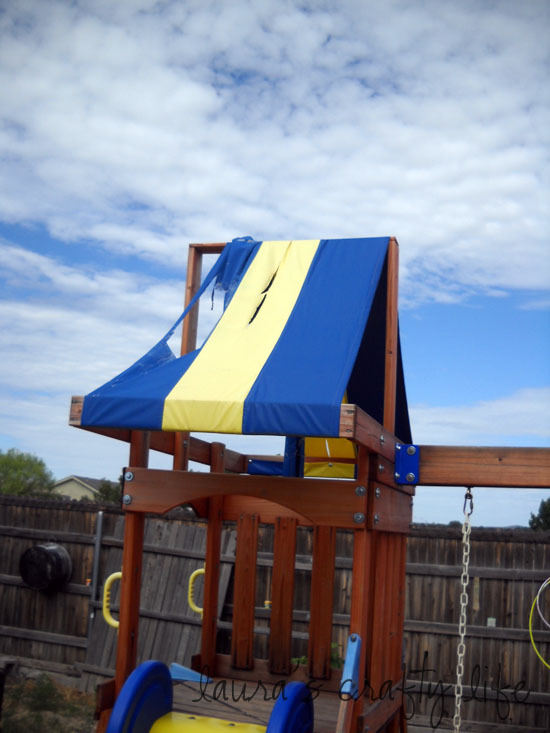 To create a new canopy for the swing set, I used an old E-Z Up cover we had. We have had the absolute worst luck with E-Z Ups. They always get broken or bent. Once the E-Z Up was trashed, I saved the fabric cover. It is meant to be outdoors and was already blue like the old one, so I knew this would work perfectly. Using the old canopy as a pattern, I cut out and sewed a new canopy. It was basically just a giant rectangle. I used one finished edge, so I only had to finish the other three. I am so happy to have this area done. I love that it looks as good as new again! I am hoping not to have to stain it again for a few more years. :) Have you tackled any renovation projects lately? 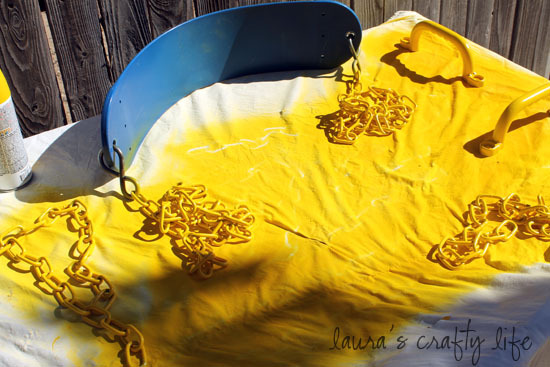 I am excited to have discovered your blog as we both love crafting/scrapbooking! I am excited to be your newest follower! Great update! We got a free 20 year old set and I am so excited to see that paint – I’m definitely going to pick some up! Looks great! It really does look brand new! Where did you get your replacement canopy? I sewed one. I used fabric from an Easy-up that broke. I used the torn one as a pattern to create the new one. Did you sand the set before you stained it? No. I just stained. It would probably be better to sand, but it was going to be too much extra work. I did sand a few spots where the wood hand been scratched up by our dog, but that was it.